Advantages: Over 225 B&W and color photos; 40 superbly executed color profiles; appendices feature unit badges, and available kits and decals. Since Peru received Mirage 5’s in 1968, Dassault’s distinctive designs have stalked South American skies. 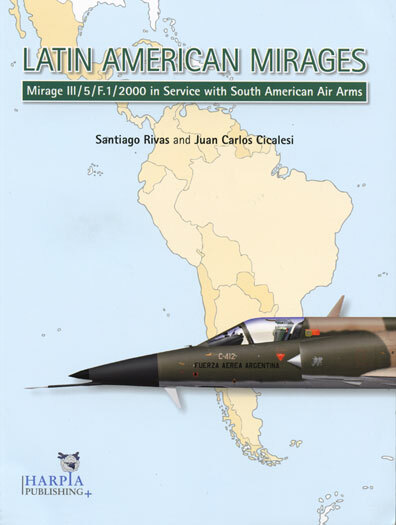 Four decades later, Harpia Publishing tells the tale in a magnificently researched, lavishly illustrated volume, Latin American Mirages - Mirage III/5/F.1/2000 in Service with South American Air Arms. Authors Santiago Rivas and Juan Carlos Cicalesi cover coups, crises, and conflicts. The absorbing, admirably indexed account details every Latin American Mirage by service, serial, roster, and fate. And spellbinding sidebars season the story with notes on Kfir and Cheetah derivatives. Alphabetically organized by country, chapters include background factors, variants, operational service, local modifications, modernization efforts, and – where applicable – combat history. All denizens of South America’s Mirage menagerie appear – Neshers, Daggers, Maras, Panteras, Elkans, and more! Over 225 B&W and color photos illustrate this terrific tome. Modelers and markings enthusiasts will especially appreciate the 40 superbly executed color profiles by noted artist and historian, Tom Cooper. Handy appendices even feature unit badges, and available kits and decals! Harpia Publishing is forging a deservedly radiant reputation for unearthing aviation exotica with gems like these.